How old does my puppy need to be before I can start housebreaking him? Start housebreaking your puppy as soon as you get him. If you wait, he’ll get in the habit of going potty in the wrong places and he’ll have a much harder time understanding the training once you decide to start trying to housebreak him. It’s much easier to build good habits than it is to break bad habits, so start a good, consistent housetraining program as soon as you get your new puppy. My puppy can go all night without needing a potty trip, so he should be able to go 8-10 hours during the day without needing a potty trip, right? Wrong. Sorry, but it doesn’t work that way. Your puppy is able to hold it overnight because he’s not eating or drinking anything and he’s not physically active during those hours. Very young puppies will need to go out frequently during the day. The time between potty trips can gradually increase as your puppy gets older and is more able to control his bladder and bowels. For a detailed scheduling chart, see Commandment #6. How many times a day does my puppy need to be taken out to potty? The number of potty trips your puppy will need each day depends on his age. The younger your puppy is, the less bowel and bladder control he’ll have and the more potty trips he’ll need. If your puppy is less than 6 weeks old, plan to take him out every 30 or 45 minutes during the daytime. If he’s 6-12 weeks old, plan to take him outside every hour. From 12-16 weeks, he’ll likely need a potty trip every 2 hours and from 4-6 months, every 3 hours. These are general guidelines, of course, and you may find that your puppy needs more or less frequent potty trips. For a detailed scheduling chart, see Commandment #6. Remember, regardless of how long it’s been since he last went out, your puppy should be taken to his potty spot after coming out of his crate, after napping, after playing and after eating or drinking. Also take him outside anytime you see signals he needs to go potty, even if he’s had a recent potty trip. My 4-month-old puppy is still waking up twice overnight to go out to potty. Will I ever get a good night’s sleep? Most puppies are able to make it through the night without a potty trip by the time they’re 3 or 4 months old. If that hasn’t happened for your puppy yet, try feeding him earlier, since you don’t want him going to bed with a full belly. Last food and water should be given well before bedtime. 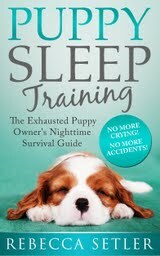 You may also find it helpful to exercise your puppy in the evening so he’s definitely ready to snooze by bedtime. Another thing that can contribute to this problem is making your dog’s middle-of-the-night outings fun. Overnight potty trips should be a quick in and out, with no talking, no playing, and no food or water for puppy. Follow these rules and your puppy (and you!) should be sleeping through the night in no time. If these solutions don’t solve your problem, you may want to talk to your vet, since there may be a medical problem contributing to your puppy’s need to potty frequently overnight. I just got a new puppy. Should I paper-train him? There’s no getting around it. When you paper-train your dog, you’re teaching him the opposite of what we want him to learn in his housebreaking: You’re teaching him to go potty in the house. If your goal is to have a dog who goes potty only outside, paper training will not only not help you to housebreak your dog, it will slow the process considerably. Can I leave my puppy in his crate all day while I’m at work? No. Young puppies have limited bladder and bowel control and can’t go all day without a potty trip. If you work long hours, you’ll need to plan to come home at lunch or have someone come over in the middle of the day to care for your puppy. If that isn’t an option, you’ll need to temporarily do indoor potty training, giving your puppy access to newspapers, potty pads or a litterbox where he can relieve himself while you’re at work. When he’s older, you can begin housebreaking and crate training him. My older dog is perfectly housebroken. Won’t my puppy just learn to be housebroken by watching and following him? For some puppies, watching another dog do the right thing is helpful, since puppies often mimic the behavior of older dogs. However, your dog can’t be the only one working on your puppy’s housebreaking… you’re still the one responsible for the supervision, scheduling and confinement program that will teach him to grow up to be a good boy like your other dog.